$115.00 plus $15 shipping and insurance within the Continental United States. For local sales, shipping charge will be allocated to NYS Sales Tax. Please email me at JamieWG@aol.com for International purchases or with any questions. I met with my friend Sue to paint at the lakeshore this morning. The lake was covered with a thick morning fog, so I went inside for more coffee and returned as the remaining haze started to burn off. The trees were crisp and brilliant, with strong contrasts, and the remaining fog blanketed the background over the lake, partially obscuring the far shore. What a sight. 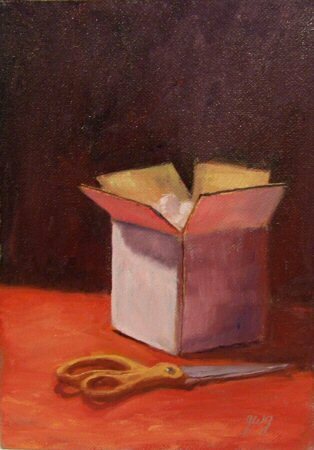 Then I realized that I’d forgotten to bring my oil painting pochade box. I didn’t feel like setting up a big french easel for a small painting, so I pulled out my gouache box which I happened to have with me, and painted in gouache instead. Every time I paint in gouache I wonder why I don’t do it more often. I adore this medium. 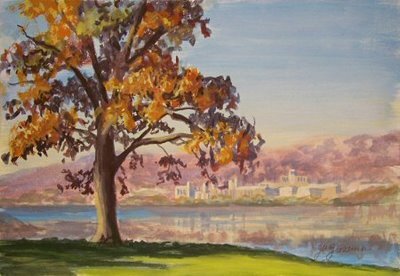 It has the blendability/opacity benefits of oils, with the water solubility of watercolor, the crispness of acrylic, and the archival characteristics of the very best art mediums (if one chooses their pigments carefully, which I always do). It dries quickly to a nice, matt finish so it’s easy to photograph, can be sent out immediately, and is simple to frame. 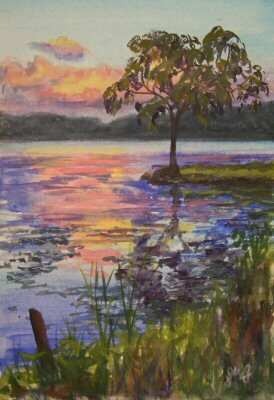 I’m fortunate enough to live on a lake, and ran out to paint a quick sunset with a painting friend from out of town. There was goldenrod blooming all over the shoreline (which, by the way, I seem to be allergic to)! Tomorrow morning I’m supposed to paint the sunrise with another friend. We’ll see if I can haul myself out of bed early enough on a weekend! 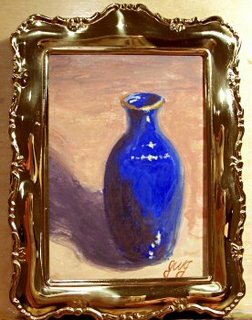 This darling cobalt blue vase has appeared in many of my paintings. This is a teeny tiny mini, painted from life. It’s just 3″ x 2″, perfect for a tabletop, and comes with the frame shown, which has an easel back to stand it up on your favorite side table, coffee table or dresser. In the art world, ACEO stands for Artist Cards Editions and Originals. They are collectible paintings in a standard, miniature format. The size is 2.5×3.5″, like baseball cards and playing cards. They are so much fun to paint and collect that every so often I do a few of them. Some artists sell prints of paintings in that size as ACEOs, but mine are always one-of-a-kind originals. ACEOs are truly fun to collect for those who love art. Everybody can find a place for these little gems, and they are reasonably priced. It’s an easy way to collect work from some favorite artists. 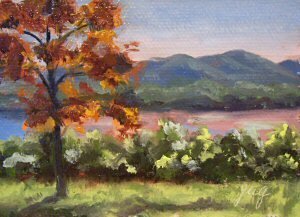 This tiny painting is of one of my favorite views overlooking Constitution Marsh from Boscobel Restoration in Garrison, NY. The marsh along the Hudson River is ablaze with color in fall, and this tree at the edge of the overview site is always stunning this time of year. 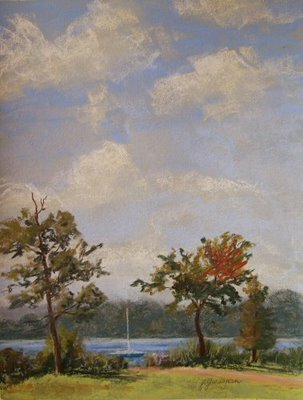 I’ve painted the fall marsh there in just about every size over the years, up to 24×36″. I feel so fortunate as an artist to live on a lake where I can just walk outside to paint or take photos. 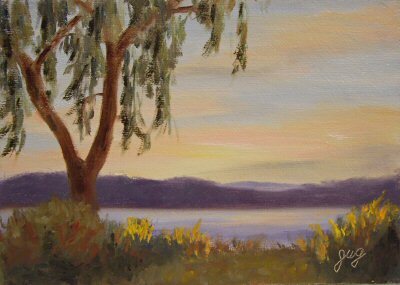 This was painted this morning from a photo I took while out for an evening stroll with my husband. 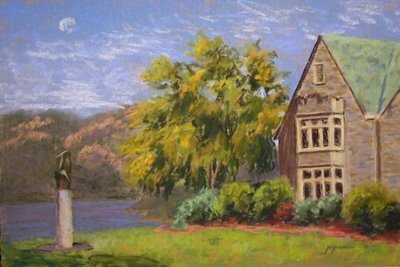 Saint Basil Academy is a home to children in need, where they are nurtured to adulthood on the gorgeous property overlooking the Hudson River opposite West Point. They kindly allow me to paint there on location, but this painting was done from a photograph that I took there last fall. The property has an amazing history; a former owner had a zoo there! Some of the old buildings are absolutely gorgeous. I’ve started painting those too. I love painting white objects on a colored surface, catching the reflected color and playing lost and found with edges. I had a lot of trouble getting a decent photo of this painting. There’s some glare in the background, and the background is reading as black rather than the deep purple present in the painting. 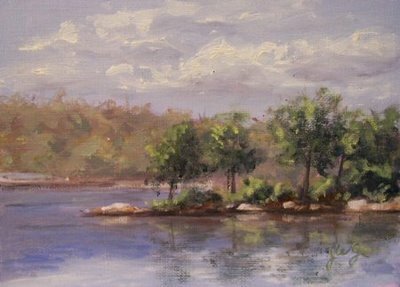 This small oil painting was begun on location at a nature preserve adjacent to Playland Amusement Park in Rye, NY, and finished up in the studio today. This was a day to do some quick sketches and reorganize the studio a bit. Once winter hits, I’ll be working in here most of the time. I’ll take some photos soon and post a studio tour here, so you can all come visit! Tonight is the opening of my show at Putnam Arts Council’s Belle Levine Gallery. ‘Hope to see some of you there! St. Basil’s Academy is a residential facility for children that overlooks the Hudson River. They are having a fundraiser at the end of September, so I’ve been doing some paintings here to make some sets of note cards for them to sell at the fundraiser and hopefully after as well. This morning the light was spectacular, with the fall color just emerging and the moon still visible in the western sky. 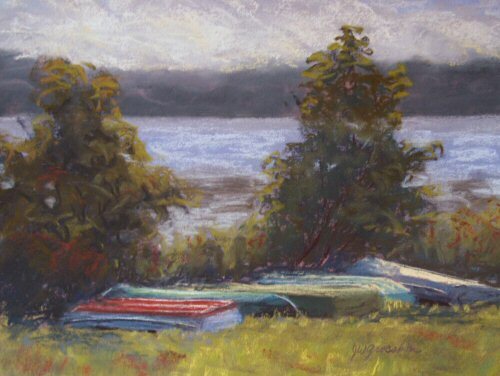 This was painted on location along the Hudson River shoreline in Hyde Park, NY. The sky was clear, so there were no brightly colored clouds at sunset, but the strong light dramatically lit the trees and foreground. I loved the look of the sun hitting the boats turned upside down along the shoreline. 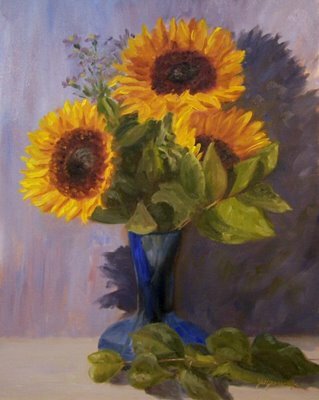 I moved my easel close to them and painted in the midday sun. Oops—I forgot the sunscreen. Fortunately I had a hat on, but the rest of me caught some pretty strong rays. Hopefully the painting was worth it! Good day, sunshine! What a beautiful morning out by the lake. I needed to capture the ‘big sky’ view of the surroundings. It was my daughter’s first day of school! That meant that I was free to paint by around 7am! I was test driving a new pastel setup, so stayed home by the lake. 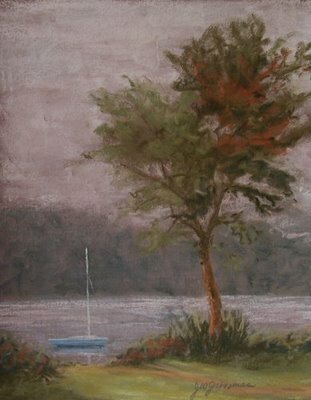 It was a heavily overcast, dark morning, but I was so excited about finally having a chance to get outside with pastels that nothing was going to deter me; I’d just paint the fog. Once I got set up, I realized I forgot the pastel paper. It’s a good thing I’d stayed close to home! Bannerman’s Island is supposedly haunted, treacherous to reach by boat due to strong currents, and covered with poison ivy. Although it is off limits to the general public, that description makes you wonder why anybody would want to go there anyway! The island has a fascinating history, and the last owner built a huge armory castle along the shoreline, with a residence castle at the peak of the island. He began constructing towers in the water to form a grand entrace, and sunk all kinds of debris around the perimeter to deter trespassers. A huge fire gutted the structures. Some of them are held up only by the poison ivy vines growing up the sides. 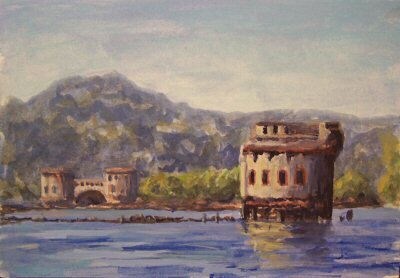 You can imagine the thrill I got when I was asked to go by boat out to the island to do a painting for an auction to benefit Bannerman Castle Trust, the organization charged with renovating the exquisite structures. I jumped at the chance. I took some pictures along the way, knowing that painting there on location was not something I’d be able to do again very soon! 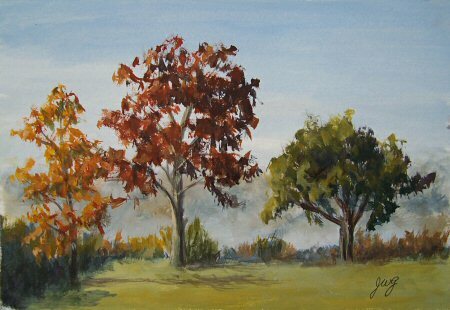 I had hoped to return to paint there again this year, but wasn’t able to arrange the date. This is a small gouache painting on Arches hot press watercolor paper, done from one of those photos I took on my expedition.